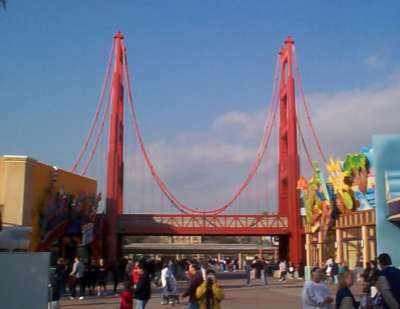 Disney is opening a new theme park right next to Disneyland, called Disney's California Adventure, on February 8, 2001. 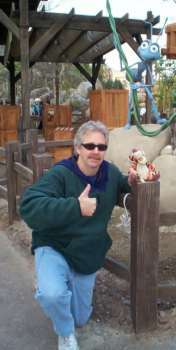 As Disneyland Annual Passholders, we were allowed to purchase tickets to a "Preview Day" at the park - Monday, January 29. We've been watching the construction of the park for the last 3 years, so we've been very interested in seeing what the real thing is going to be like. With a name like "California Adventure", it's probably not too hard to guess that the park is themed to the Golden State of California. 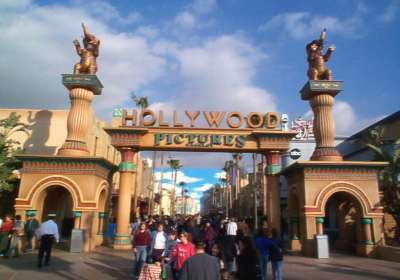 :-) The park is divided into 4 different areas: Sunshine Plaza (the entrance), Golden State, Paradise Pier, and Hollywood Pictures Backlot. 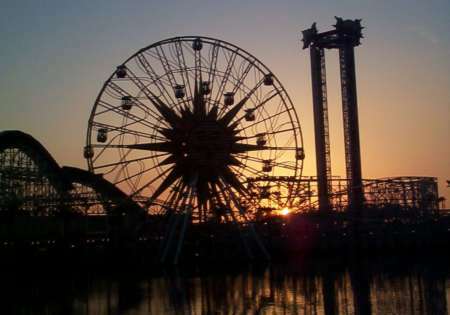 There are some attractions (MuppetVision, It's Tough to Be a Bug) that are identical to the ones at Walt Disney World in Florida, and some that are re-creations of old amusement park attractions (the Sun Wheel, The Stinger), and some that are uniquely Disney (Soarin' Over California, California Screamin'). We also attended a Sneak Preview of DCA on January 19th, but that was at night, and we didn't have a chance to really see the park, though we did have time to experience some attractions that we did not have time for on Monday. So this trip report is kind of a combination of both those trips. At this point we've experienced almost all of the attractions and shows, and so we've rated them in these pictures - thumbs up, thumbs down, or so-so. Monday was cloudy and chilly (yes, for us chilly means highs only in the 50s. :-) ), though the sun came out a little in the afternoon. We arrived at the park a few minutes before the 10:00 opening, and got our special Annual Passholder's Preview pin as we walked through the gate. Cool! 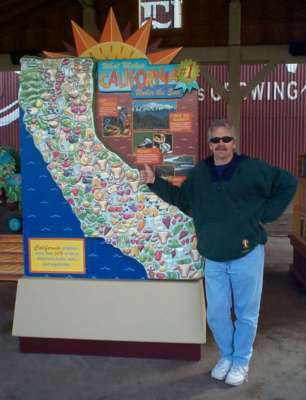 The first area we headed for was Paradise Pier, so we could ride the roller coaster - California Screamin'. We had about a 15 minute wait. Woo hoo! 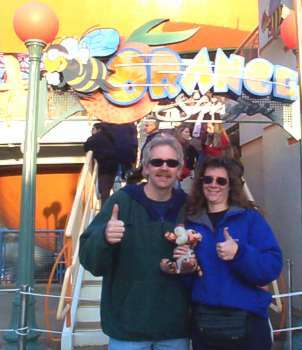 This attraction got 3 thumbs up - from Lee, me AND Tigger. 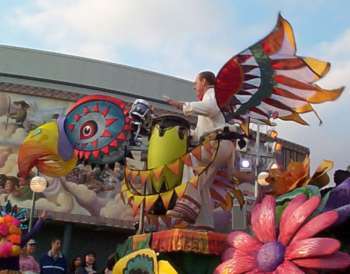 It's VERY smooth, and has lots of turns and drops - and of course the loop around Mickey's head. :-) There's music playing in your ear as you ride - nothing I recognized, but it's appropriately "beachy". It's also a pretty long ride, both in track (over a mile of track) and time. 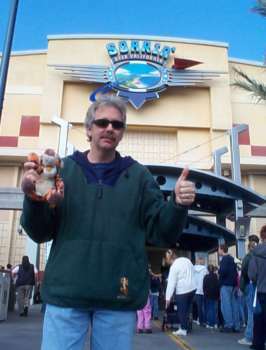 I like it much, much, better than Rock N' Roller Coaster at the Studios in Florida. It was exhilarating, and we rode it twice - first thing in the morning, and the last thing we did before we left that night. We tried the Sun Wheel next. This is an attraction inspired by something similar on Coney Island. Hmm...how does one describe the Sun Wheel? It's kind of like a 150' ferris wheel, except that 16 of the 24 gondola cars are on their own tracks (shaped kind of like a trapezoid), and slide in and out on their tracks and swing as the wheel moves around. You can sort of see the tracks in this Paradise Pier picture. We chose to do the "Swinging Gondolas" rather than the stationary ones, which meant we waited quite a bit longer - about 35 minutes. No FastPass for this attraction, which surprised me, and the queue area was NOT sufficient to handle the crowd, which spilled out onto the boardwalk. Anyway...you get a really nice view from up there, but it's kind of a shock when your car all of a sudden starts sliding towards the outside of the wheel! :-) It takes one revolution of the wheel (8 stops - they load 3 cars at each stop) to get all the cars loaded, and then you get one uninterrupted revolution of the wheel, and then the stops/starts as they unload/reload. It takes 10 minutes or so. 3 thumbs up initially (Tigger liked the swinging a lot), though I think Lee has since revised his vote to be so-so. We went next door to the "Maliboomer" - DCA's answer to the Tower of Terror, I guess. Though I think it's exactly like Dr. Doom's Fearfall at Universal's Islands of Adventure. You're strapped into a seat and then launched 100 feet or so into the air, then you bounce up and down a bit until you come back to the ground. The launch is quite a rush! 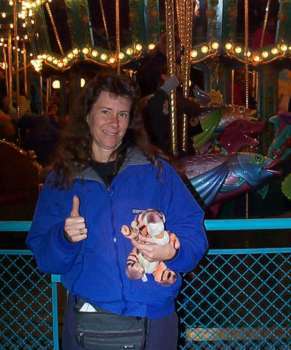 It's fine for what it is, and got 3 thumbs up from us (Tigger loves *anything* that bounces! ), but don't expect the Tower of Terror. This was another place we waited in line for 30 minutes - no FastPass in sight, though at least the queue was more than sufficient for the crowd. AFTER the fact we discovered that there's a singles line. I'll digress for a moment to comment on the music - the Paradise Pier area is themed like a seaside California amusement park (there's even sand around the base of the roller coaster), and the music playing in the background was instrumental arrangements of well-known Beach Boys, Mamas and the Papas, etc. tunes. It seemed very appropriate for the area. Lee reminds me that both on Monday and when we were here on the Sneak Preview Night there was a mobile rock band driving around in a vintage car (El Camino, maybe?) and stopping at various places around Paradise Bay to play. 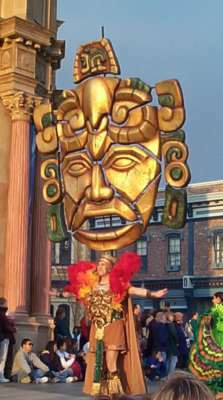 That type of entertainment is something that we've always really enjoyed at Epcot, and thought there wasn't enough of at Disneyland. 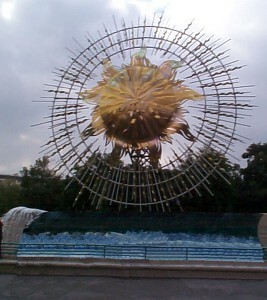 "The Orange Stinger" is another replica-type attraction. It's inside a giant orange (and the texture on the outside of the building even looks like orange peel!). Everyone sits in swinging chairs, which lift off the ground and the whole thing revolves several times before you are lowered back to the ground again. It was a lot of fun, and had almost no line. 3 thumbs up from us! "King Triton's Carousel" was the final attraction we did over in the Paradise Pier area. This is a beautiful carousel, and there are six different types of sea animals depicted: sea horses, seals, whales, fish, dolphins, and otters. Even though there are multiples of each type of animal, no two are painted exactly the same - they're all in beautiful jewel-like iridescent sea tones. All of the animals go up and down, though the ride is short - only 5 revolutions. 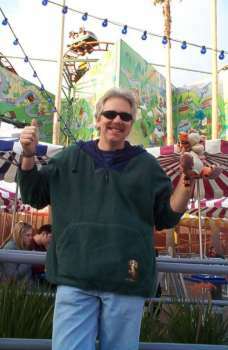 Lee's not really into carousels, but he rode it to humor me. So it gets a so-so rating from him, and 2 thumbs up from me and Tigger. 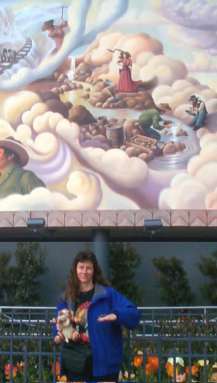 I'm skipping in our day a bit, because we did most of Paradise Pier in the morning, but we ate dinner at "Pizza Oom Mow Mow", whose motto is "In Crust we Trust", and the pizzas are oval - shaped like surfboards. The concept and theming were good but the pizza was pretty bad. I was not happy because I ordered their "Big Kahuna" which was supposed to have Canadian bacon and pineapple - but it was ALSO topped with red, green and yellow bell peppers and onions. I hate peppers, and there was no mention of them on the menu. Redd Rocket's in Disneyland has MUCH better pizza. Definitely three thumbs down here. There's also a place called "The Burger Invasion" which is <gasp!> a McDonald's. (We don't have the problem some people do with having a McDonald's inside the park - all the fuss about it seems very silly to us. It doesn't seem any different than having a Wolfgang Puck restaurant, or only serving Orville Redenbacher's popcorn.) Lee says I should mention that Burger Invasion is well-themed, with only a fairly small set of golden arches to identify it as a McDonalds. There is a sit-down restaurant called "Avalon Cove by Wolfgang Puck", which features seafood. 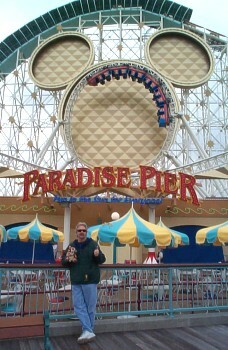 Time to leave "Paradise Pier" and head into the "Golden State" area. "Golden Dreams" is a movie about the real-life people who shaped the history of California - from the Native American tribes to the Silicon Valley dotcom millionaires. It's narrated by the Spirit of California, Califia, portrayed by Whoopi Goldberg - and there's an interesting effect associated with that, but I won't spoil it. :-) We actually saw this on the night we were here for the sneak preview, since one of the clues on our scavenger hunt that night required us to see the movie (though I knew the answer just from the clue). The movie was fine, but not something that I'm going to rush back to see again and again. 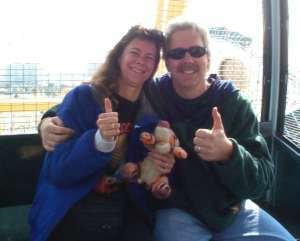 Lee likes that sort of thing more than I do (he always wants to see The Amercian Adventure and Circle of Life at Epcot), so it gets a thumbs up from him and a so-so from me and Tigger. We had lunch over in the Pacific Wharf area, at the Pacific Wharf Cafe. Their specialty is soups and salads served in sourdough bread bowls. Pricey (about $8.00 each - all food prices seem higher in DCA than Disneyland), but good, and of course the bread itself is VERY filling. There was no inside seating, though, which I would've liked since it was a cool day, and I was cold by this point. There are also Mexican and Chinese food places in this area. 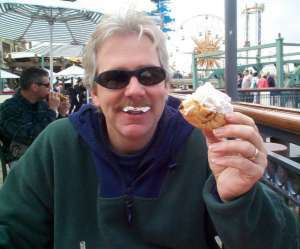 We shared a chocolate cream puff for dessert...but cream puffs always *sound* much better than they actually *taste*. Though it was worth it for the entertainment value of watching Lee eat his half. :-) This is a place we'll go back to, though. 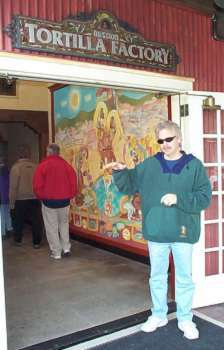 In the Pacific Wharf area are two factory tours - one of the Boudin Bakery, and their method of making sourdough bread (the bread they bake is used in the Pacific Wharf Cafe), and one of the Mission Tortilla Factory. The tour of the Tortilla factory is a pretty quick walk-through - but at the end they give you a fresh corn tortilla hot out of the machine. It still only rated 3 so-so's, though. We had done the Bakery tour on our Sneak Preview night. The tour is "hosted" at the various stops by Rosie O'Donnell and Colin Mockrie, and was actually pretty entertaining - did you know it takes *3* days to make a loaf of sourdough bread??? Again, not something we'll rush back to do again, but it was interesting and well-presented. 3 so-so's. From the Pacific Wharf area you proceed into the "Bountiful Valley Farm" area. I'd have to say that I thought this area was the most disappointing - there just wasn't much here. 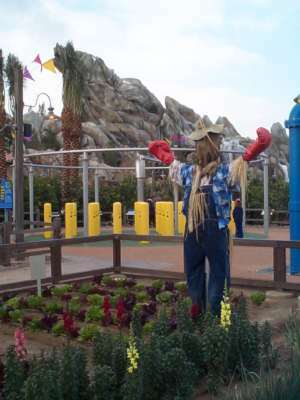 They are growing various crops in different areas (and the scarecrows are pretty funny - I liked the one wearing boxing gloves), but mostly it's just a bunch of static displays telling you about the variety of crops grown in California. The displays just aren't very "Disney" - they seem like something you'd find at a science center or museum. California IS the #1 state in agriculture, and it's a huge part of our economy - you'd think they could have done better with this. As a Central Valley farm boy Lee gave it a thumbs up, but it gets thumbs down from me, and Tigger was non-committal. "It's Tough to be a Bug" is over in the Bountiful Valley Farm area. 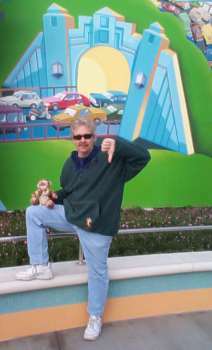 It gets a thumbs up from Lee and Tigger and a so-so from me - it's not one of my favorites. Though we didn't eat there, the Bountiful Valley Farmer's Market looked like it had some pretty interesting items on its menu - several different kinds of wrap sandwiches and salads. We'll have to try that one in the future. 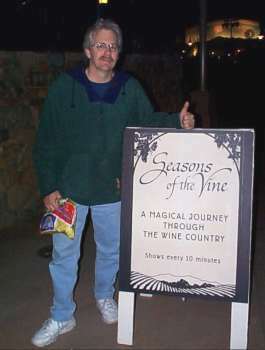 The "Golden Vine Winery" area salutes California's wine country. We learned some really interesting things here - did you know that Anaheim used to be the largest wine grape producing area in California? But then this little pest came in and introduced something called "Pierce's Disease", which makes the ground unfit for grapes *forever*. So that's when the farmers planted citrus groves instead. (They actually are growing some grapevines on the side of Grizzly Peak - I'll have to find out how the disease will affect *those*.) There were many "wine educators", who work for Robert Mondavi, around to answer questions. There's a 10 minute movie called "Seasons of the Vine" that illustrates the wine-making process, and it was well done - we gave it 2 thumbs up, and a so-so from Tigger - he's not very interested in wine. And, believe it or not, you can actually BUY and drink wine here. Yes, inside a Disney park! :-) There's also a very nice (and expensive) restaurant, plus a terrace restaurant that serves wine and appetizers. We'd like to try those out sometime. 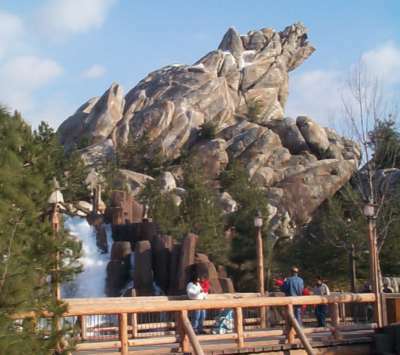 The "Grizzly Peak Recreation Area" is pretty easy to find - just look for the 150' mountain shaped like a grizzly bear. 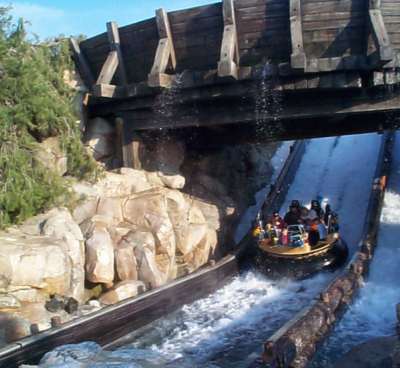 :-) We have not done the Grizzly River Run raft ride, because they assure you that you WILL get wet, and it's just been too cool both times we've been there to make getting wet very appealing - I was having a hard enough time staying warm when I was dry. There's a trail that runs along part of the waterway, though, and you can see what some of it looks like - it looks like a lot of fun - much better than Kali Rapids at Animal Kingdom. "Condor Flats" is a tribute to California's aviation history. 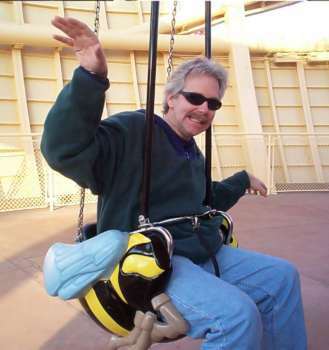 THE attraction is something called "Soarin' Over California". You sit inside a theater with a VERY wide screen...but these are not ordinary seats. :-) The seat assembly pivots into the air so you're hanging in space, while in front of you on the screen (filling your field of vision) you appear to be flying through various scenic areas in California. The seats tilt back and forth and air blows in your face to give you the sensation of flying, and they put different scents into the air - like orange when you're flying over the orange groves - to further heighten the effect. And that's really a very inadequate description of something that is a VERY cool attraction. This is another thing we did on our Sneak Preview night, and I'm very glad we did, because the wait was never less than 120 minutes on Monday, and at one point it was up to 180 minutes!!!! Now, I REALLY enjoyed Soarin' Over California, but NOTHING is worth a three hour wait! The restaurant here is called "Taste Pilot's Grill" - I think the name and the building are cool. :-) It serves gourmet burgers, chicken sandwiches and things like that, and Lee would like to try it. 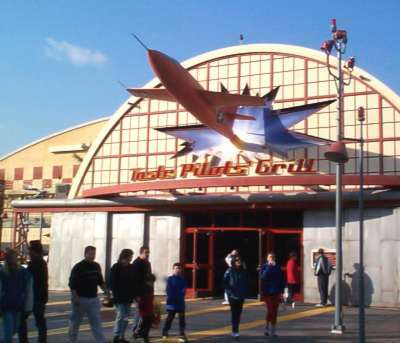 This was another area where we really noticed the background music - it was soundtracks from movies like "The Rocketeer" and "The Last Starfighter". Lee reminds me that when we were here on the Sneak Preview night there was an acapella quartet performing outside the gift shop, but we were in "Park Commando" mode and didn't stop to listen. And with that, we're finally leaving the "Golden State" and heading off to the "Hollywood Pictures Backlot". 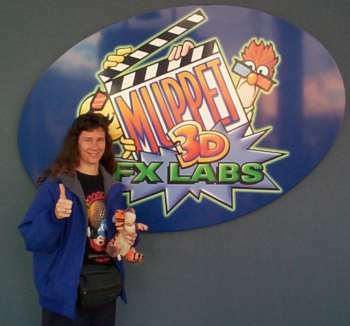 "Muppet Vision 3D" is another attraction transplanted from Florida, and is identical to the one there. The queue area is somewhat different, though. There are posters for a variety of movies starring the Muppets - Piggy Woman, Forrest Green, Men in Plaid (starring Stadler and Waldorf) and more that are so bad I don't even remember them. 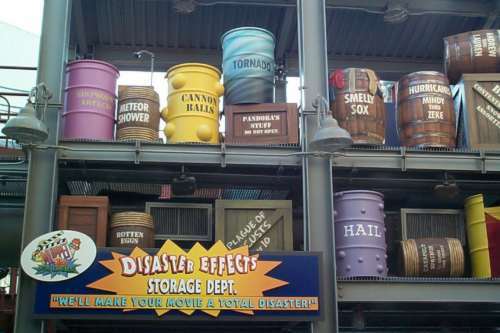 There's also a number of props - like those in the "Disaster Effects Storage Dept.". The pre-show is the same, but some of the stuff stored in that room is different - I did NOT see A Net Full of Jello. :-) This gets two thumbs up from me and Tigger, and a so-so from Lee. "Superstar Limo" is a ride on a track through a bunch of scenes, ala Mr. Toad's Wild Ride or Alice In Wonderland. It was pretty bad. We give it 3 thumbs down. On our preview night we had dinner at "Hollywood and Dine" - it's a food court, and offers sandwiches, pizza, Chinese food, and burgers. The food was decent, but not exceptional. The dining area IS indoors, though. 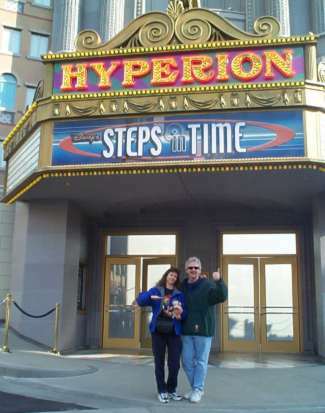 The Hyperion Theater is a Broadway-type theater, (seats 2000) which has the feel of a plush 1940s theater. It's really nice. The live stage show is called "Disney's Steps in Time", and features modern arrangements and dance interpretations of many Disney classics. It's very high energy. I didn't really care for it, but Lee loved it. So it gets two so-so ratings (Tigger thought it needed Pooh characters) and a thumbs up. "Disney Animation" is much different than the "Animation Tour" in Florida, though it has some elements of that. This is not a tour, and you can spend as much or as little time as you want to inside. They limit the number of people allowed inside, so there can be a wait to get in. Inside the Animation building are 5 different areas. The first is a large open (but darkened) room, with projection screens of different sizes all around the top, all of which are displaying scenes from various movies - some showing concept art/sketches, and others showing the final product. At any given time, only scenes from one particular movie are being shown, and music from the movie accompanies the scenes. There are some padded benches where you can just sit and watch for a while. We watched for about 10 minutes at one point, without seeing anything repeat. Around the perimeter are the entrances to the other 4 areas - a theater where they are showing "Back to Neverland" with Robin Williams and Walter Cronkite (identical to Florida), another theater where an "animator" interacts with Mushu and talks about how characters are developed, a gallery with exhibits showing the development of various characters, and then the interactive area, The Sorceror's Workshop. All of the other rooms exit back into the big projection room, so you don't have to exit the building until you are ready to do so. I think they need to put some more seating into the projection room, but in any case, since two of the areas are already sit-down, it's a great place to come and relax for a while and soak up the Disney animation. Three thumbs up from us. In the "Hollywood" area there's also an action/stunt show called "Get a Grip". We saw a little bit of this during the preview night, and Lee thinks it has potential, while I'm pretty unenthused about it. I think Tigger agrees with Lee. 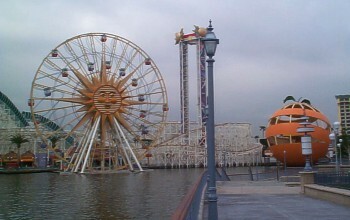 California Adventure definitely gets three thumbs up overall, but there is certainly room for improvement in some areas. I don't think the park is very balanced - most of the ride attractions are over in the Paradise Pier area, and I think that people are going to be spending a lot of time there (including us). I expect it to be extremely congested. 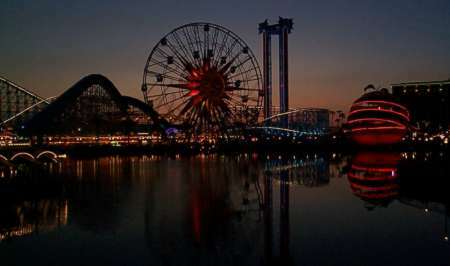 Probably Paradise Pier will be DCA's version of Fantasyland - better known to us as "Stroller Hell". Speaking of strollers...this park is designed for an older crowd, and I think the small fry will not find it very appealing. There are several play areas (including a couple where they can get very wet), but with the exception of Tough to Be a Bug and Muppet Vision, there isn't much of a Disney presence that small children will find familiar, and all of the best attractions have height requirements. We were told by a Cast Member that park capacity is only 30,000 (as opposed to almost 90,000 at Disneyland), and for previews they were selling about 15,000 tickets. If the day we experienced was half capacity, I certainly do NOT want to be there on a full capacity day...the lines we encountered were tolerable (except for Soarin' Over California), but that's about my limit. The park does seem very roomy, though, and it didn't FEEL very crowded at all, even in Paradise Pier which is where most of the people were (other than the idiots standing in the 3 hour line at Soarin' Over California). 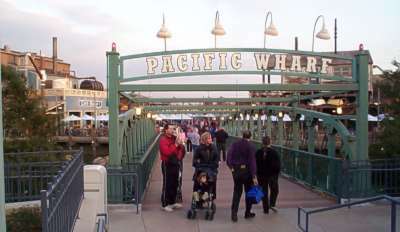 Several of the Paradise Pier attractions had problems with their queues getting full and spilling over into the walkways - and that was on only a half-capacity day! And FastPasses were gone by noon - again on only a half-capacity day. I think DCA's first six months are going to be pretty tough - either lots of sold-out days or lots of long, long lines, or both. There seem to be more areas to just "hang out" than there are at Disneyland - places to just sit and watch the world go by for a while. There are plenty of things to *do* - we were there all day on Monday (10:00-8:00), and didn't have time to do everything - but combined with our evening there 10 days before we've managed to do almost all the attractions. But we still haven't eaten in very many places, and we've hardly been in any of the shops. It's going to be interesting to see what kind of effect DCA has on Disneyland's attendance - if it will go down a little because people can go to the new park, or if it'll go up because there will be more people coming to the area who wouldn't otherwise make the trip.